Splendid! I must say. 2015 is being a wonderful year for all of us at ArykTECH and for you, our fans, I trust, 2015 has being good, too! At ArykTECH, we set certain goals for the year 2015 and we are able to achieve all our projections -this is all thanks to God for blessing ArykTECH with awesome fans like you! ArykTECH says thank you! And to top it all, or, wrap it all should I say, ArykTECH is throwing a little PROMO at you! Can you catch it? Let's see. FIX-IT-ALL Promo! For some of you, our fans that have being waiting to see our way of saying thank you, here it is. We think FIX-IT-ALL Promo is a good way of saying thank you to our fans and of course, not only a goodbye wish for the year 2015 but also, a welcome gesture for the year 2016. 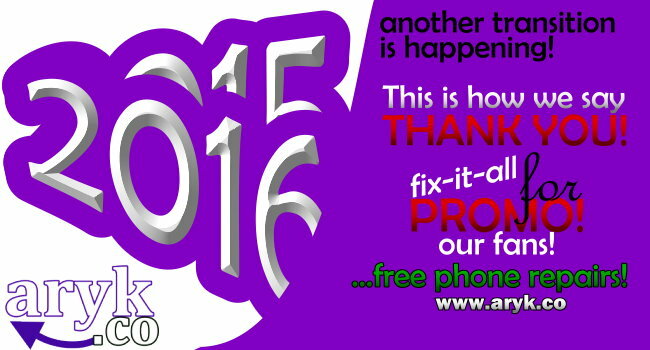 Within FIX-IT-ALL Promo period, ArykTECH attempts to fix all your phones software problems, be it iPhone, iPad, Tablets or any others completely FREE OF CHARGE! It's simple! All you have to do is register your device here. Once your device is registered, an email would be sent to you immediately confirming your device registration and also detailing FIX-IT-ALL Promo schedules. For How Long is this Promo Open? FIX-IT-ALL Promo runs from January 1st through to 31st. I Don't Know your Office, How Can I Locate it? Your device registration confirmation email will contain the office address. Please, pay attention to the content of the email. Not in Lagos? You Can Still Benefit! If you are an ArykTECH fan outside Lagos, we give you cash instead. A sum of ₦2000 would be credited to your Neteller account. Learn more about Neteller here. How Do I Participate Outside Lagos? NOTE: you should include the Hash tag #FIXITALL in your posts on Twitter or Facebook. This will help us track your participation. Once again, thank you for being honourable fans and customers!